Below is a summary of the enhancements and new features released to ZenHub Enterprise in 2.13. Click the summary item to learn more about best practices, use cases, and tutorials for each specific feature. Successful development starts with a solid plan. But when time, budget, and quality are fixed, as they are in an agile software development, how can you predict the scope of work your team can accomplish in a sprint? The answer, of course, is historical data. Velocity charts are an agile tool which display a team's historical speed of work. 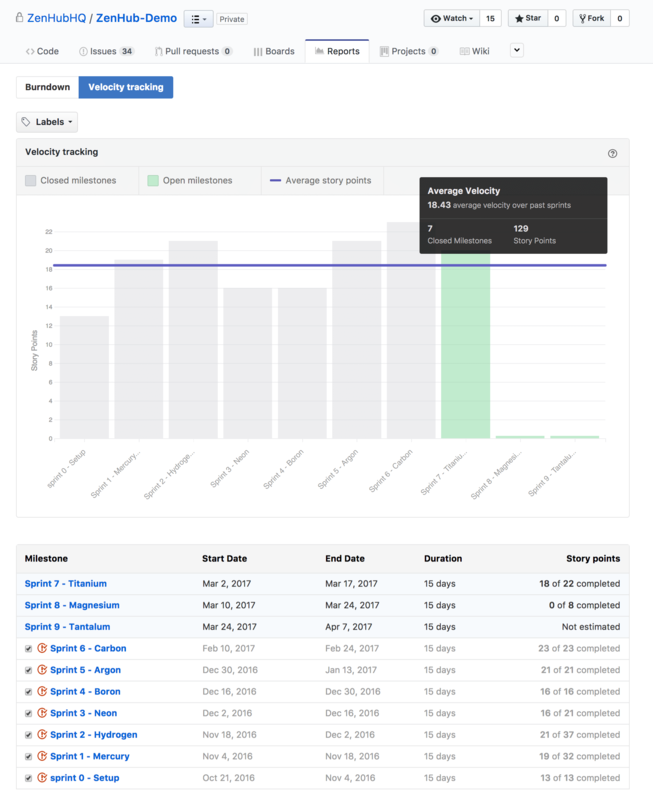 At a glance, you're able to see exactly how much value your team can ship each sprint. If you haven&apos;t already, start adding story point Estimates to your GitHub issues and pull requests. Velocity Charts displays the total number of estimates completed in your recent milestones. To access the charts, select Velocity tracking in ZenHub&apos;s Reports tab. The chart will automatically display both open and recently closed milestones, and you can hover over each bar to see more detail. Note: If you have connected repositories together, your Velocity Charts will pull in data from more than one GitHub repo – giving you an even more accurate idea of your speed. 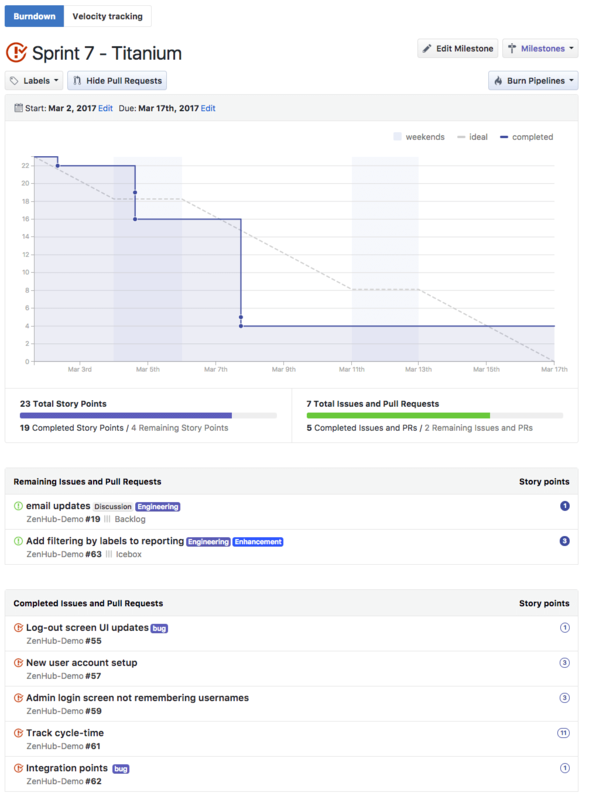 A re-designed burndown report helps teams to better track progress through a milestone. Now, burndown charts include progress bars and additional issue data on the issue list. Get Epics for a Repository — This endpoint returns an array of all the Epic issues in a repository. Get Epic Data — This endpoint returns the sum of estimates for the Epic and an array with its children issues, including information on the issue number, estimate, and pipeline. Multi-Action eliminates the onerous process of performing certain actions over and over again. Selecting multiple issues on the Board will trigger the Multi-Action action bar allowing you to update labels, assignees, milestones, epics, and make movements between pipelines to issues and pull requests at once. You&apos;ll notice that the issues remain selected so that you can make additional updates if needed. Click either Done, Clear All at the top-left corner of your board. Use bulk-actions to add new labels in repos where they don&apos;t yet exist. 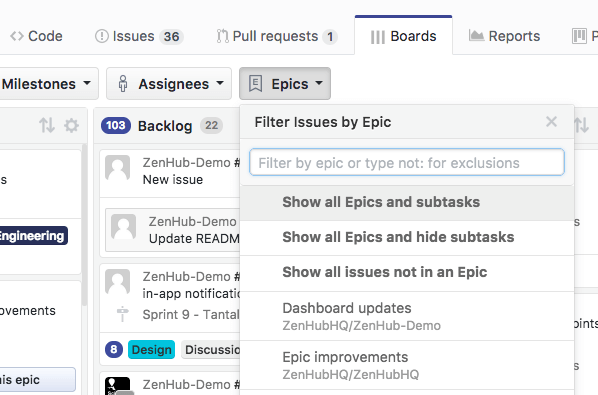 You can apply labels or milestones to a group of issues cross-repo and ZenHub will attempt to create those labels or milestones in repos where they didn&apos;t previously exist. As a Team, different members need different Pipeline "Perspectives" (groupings) to help increase focus. Pipeline sorting helps create that focus by allowing teams to drilldown on the view that's most meaningful to their workflow. After sorting, the pipeline will reorder with an added sub-header to indicate what sorting is taking place. If there are issues in the pipeline that don’t contain the sorting option, they will be put in a Not Specified grouping at the end of the pipeline. Note! Sorting by Title will not show a sub-header to indicate what is being sorted. Show all issues not in Epics — This will give you a view of all work that has not yet been assigned an Epic. Filter by any open Epic — As long as the Epic isn't yet closed, you'll see this appear in the dropdown. This will filter the Board with issues and nested Epics belonging to the Epics you've selected. Epic cards will also show the name of the parent Epic on the Board. This means if you have a nested Epic, you're visually able to identify what Epic it belongs to without having to open the Epic itself. That's all for 2.13! Check out 2.14 release notes here ✌🏻!